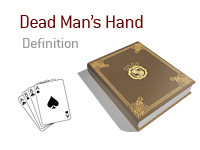 The dead man's hand, also called "aces and eights," is a poker hand consisting of a pair of aces and a pair of eights. Often, poker players will refer to any hand with aces and eights as a dead man's hand, but the term originates with five-card stud. A true dead man's hand consists of five cards, but the fifth and final card is inconsequential. The origin of this term and its usage lies in legend: Aces and eights is the hand held by Will Bill Kickok while playing five-card stud when he was gunned down at Saloon No. 10 in Deadwood, South Dakota on August 2, 1876. As the popular story goes, Wild Bill's aces and eights were all black suits: the aces of spades, the ace of clubs, the eight of spades and the eight of clubs. A dead man's hand, however, can be of any suite, including multiple suits. According to some versions of the legend, Wild Bill's kicker was a queen of clubs, although there's much debate over this aspect. Some contend that there was no fifth card because Wild Bill was gunned down before it was ever dealt. Due to its negative associations, novice players and those that don't play might expect the dead man's hand to be a playing hand of low value. That isn't the case, however, and the hand is actually quite good and often a winner. Nevertheless, American popular culture often uses the dead man's hand to symbolize bad luck, dark omens, death and so forth. The HBO series Deadwood, which featured Hickok, integrated the hand into its mythology.